Six years ago today Haiti was leveled with a devastating 7.0 magnitude earthquake. More than 160,000 were killed, 1.5 million displaced and 300,000 buildings destroyed*. Even now, scars of the tragedy still remain, as Port au Prince is still pockmarked by half-destoryed buildings and living conditions worse than before the quake. The already weak infrastructure of this country was more or less obliterated. Aid came in droves, but very little of it reached the actual citizens. Today, the NGO’s have pulled out and creditors have stopped investing. Haiti is at a developmental impasse and more economically fragile than before. As I walk through my house and look at my home decor and peek in my jewelry box at the items from Haiti, given to me by one of my best friends from one of her many philanthropic trips since the earthquake, I think of the Haitian people. Haiti is rich in the arts and despite being the poorest country in the Western hemisphere, metal artisans, papier-mâché artisans, and skilled crafts people are anxious to work and earn a living to support their families. Imagine for a moment that you lived in Haiti. You have the desire to work. You have the creative ability, but you have no job. No way to earn a living or feed your family. Can you imagine the devastation you would feel? Every time I slip on a paper bead bracelet, or look at one of the many handcrafted items decorating my home, I think of their loss, their struggle, their heartache, and their profound resilience. That’s why today, I’m writing about Macy’s Heart of Haiti. Time and time again, the commitment Macy’s made shortly after the earthquake six years ago has made me a loyal fan of the Macy’s brand and the Macy’s Heart of Haiti line of handcrafted goods. It was a bold decision to carry a line of handcrafted goods made by Haiti’s rich artist community and offer the products up for sale to customers who still picture New York City grandeur when shopping at Macy’s. Macy’s Heart of Haiti has been giving economic support to Haitian artisans ever since the devastating earthquake hit six years ago. Shortly after the earthquake, Macy’s began carrying this product line featuring an array of beautiful handmade goods crafted by artisans in Haiti. The country of Haiti is rich in the arts despite being the poorest country in the Western hemisphere. An estimated 400,000 artisans (out of 10 million people living in Haiti) rely on their handcrafted goods as a source of income. These metal artisans, papier-mâché artisans, and skilled crafts people are anxious to work and earn a living to support their families. Does the American shopper appreciate handmade artisan items made by Haitians? The answer is a resounding yes, as Macy’s Heart of Haiti continues to thrive. To date over 550 artists make their livelihood by creating goods for sale at Macy’s. While other aid organizations have come and gone, Macy’s has remained, making a commitment to the artists and providing proof that American shoppers appreciate gifts that make a difference. My newest addition is from the Heart of Haiti line of metal baskets made in the town of Croix-des-Bouquets by acclaimed metal artisans who have practiced this technique for years. The sales of these handcrafted bowls allow the artisans to feed their families, send their children to school and better support their extended families. Artisans forge these bowls out of recycled oil barrels, pounding out intricate designs, creating beautful handcrafted goods while honoring their artisanal heritage. Imagine you’re 15 years old. Now imagine you’re being targeted by the Taliban for daring to speak out about the right for all girls to be educated. Malala Yousafzai was shot in the head when gunmen opened fire on her and her friends’ school bus in Pakistan’s Swat Valley. Today, on the third anniversary of the attack on Malala and her school mates, Shazia Ramzan and Kainat Riaz, the movie “He Named Me Malala” is released nationwide to the public to tell the story of Malala and her role as a leading campaigner for the rights of children worldwide. Growing up in the United States, it’s hard for me to fathom that educating girls is an issue. How can people think that educating a woman makes her dangerous? It’s medieval thinking that makes me eternally grateful for the education I have received, and that I continue to take part in as part of my own personal growth, and it motivates me to act. 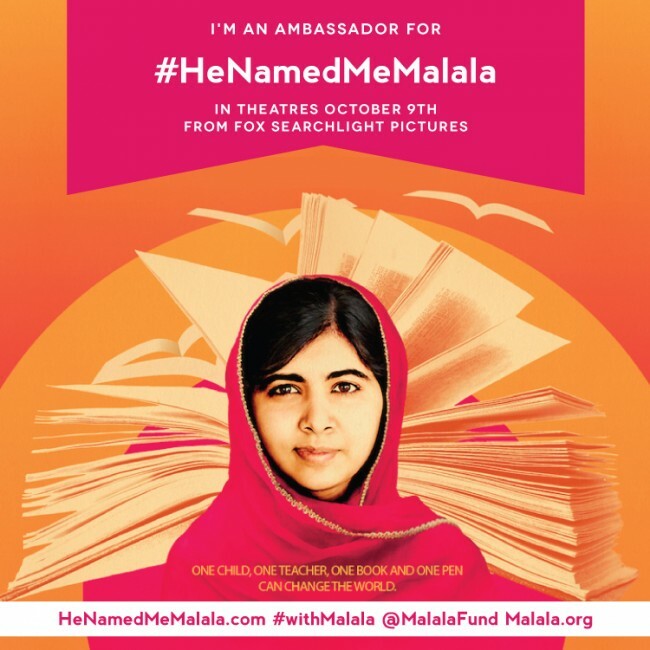 As a Global Goals Champion for the United Nations, the release of “He Named Me Malala” is in sync with Goal 4 of the 17 Goals they announced at the end of September. These goals are the focus over the next 15 years, with the UN hoping to have made significant progress in achieving them by 2030. The lack of access to quality education, especially among the poorest and among girls, prevents millions of people from escaping the cycle of extreme poverty around the world. More than half of children who have not enrolled in school live in sub-Saharan Africa. An estimated 50% of out-of-school children of primary school age live in conflict-affected areas. Children in the poorest households are 4 times as likely to be out of school as children in the richest households. Malala captured the world’s attention by standing up for what she believes. She certainly captured mine, and I have been following her story since the day her attack became news. After healing from her injuries, Malala hasn’t taken her survival for granted and is now a leading campaigner for girls’ education globally as co-founder of the Malala Fund. Documentary filmmaker Davis Guggenheim shows us how Malala, her father Zia and her family are committed to fighting for education for all girls worldwide. The film gives us a glimpse into this extraordinary young girl’s life – from her close relationship with her father who inspired her love for education, to her impassioned speeches at the UN, to her everyday life with her parents and brothers. I cannot imagine how this young woman feels, or where she finds the energy to do all she does, but I can learn from her. Malala reminds us that we can all be change agents, we just have to listen to our courage and be motivated to act. Wisdom knows no age. During a recent call with Malala, the Nobel Peace Prize winner reminded me of something I have always found to be true: There are no limits to what kids can do. Join me this weekend when I continue with part two of my “He Named Me Malala” series. Disclosure: This was not a sponsored post. I’m writing this for Miles. For San Francisco. For everyone who still believes a Superhero can save the day. There is a little boy named Miles Scott who lives in Northern California. When he was 18 months old, Miles was diagnosed with leukemia. Now in remission, he had a wish, and that was to be a superhero. Today, Miles got his wish. 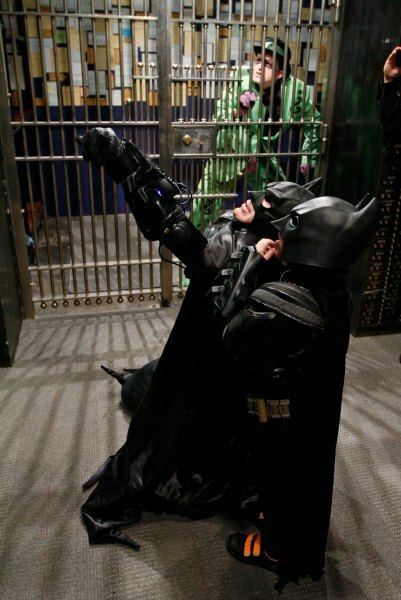 With the help of Make-A-Wish Bay Area, the Bay Area was turned into Gotham City. Over 13,000 people joined in for the adventures of the #SFBatKid. When the Make-A-Wish Foundation was working on planning this, my friend, and mentor, Stefania Pomponi, asked how they were going to spread the word. Never one to back down from a challenge, her team in San Francisco helped get the ball rolling. Clever Girls Collective sent out the Clever Signal (Sparkly Unicorns — more than 6,000 of us) and folks were all too happy to jump in and help make a little boy’s dream of fighting crime and besting the bad guys come true. 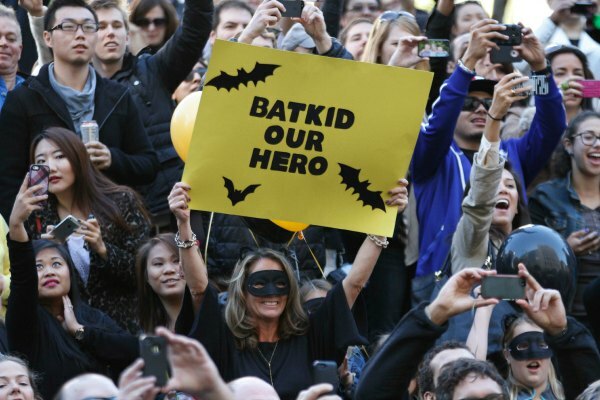 Today #SFBatkid made headlines as 5-year-old Miles Scott celebrated the end of his battle with leukemia, taking over San Francisco as his Gotham City as 13,000 joined him. The incredible #SFBatkid adventure was made possible by Make-A-Wish Bay Area who helped make his wish to be Batman come true as many other individuals and organizations offered assistance to make the day a success. One such organization was Clever Girls Collective, a technology company and social media agency in San Francisco that offered social media help to today’s efforts. Clever Girls Collective helped mobilize a vast network of over 6,000 social media influencers plus business contacts at companies like Twitter to take #SFBatKid to the next level. As events unfolded throughout the day, news organizations from across the country, celebrities like Val Kilmer who played Batman in the 1995 Batman Forever, musicians such as Hayley from Paramore, sports teams, politicians, and even Barack Obama jumped in to wish Miles well in his journey as the caped crusader with the President’s first-ever Vine video in the fast moving stream that chronicled today’s events. San Franciscans came out in droves and didn’t disappoint. 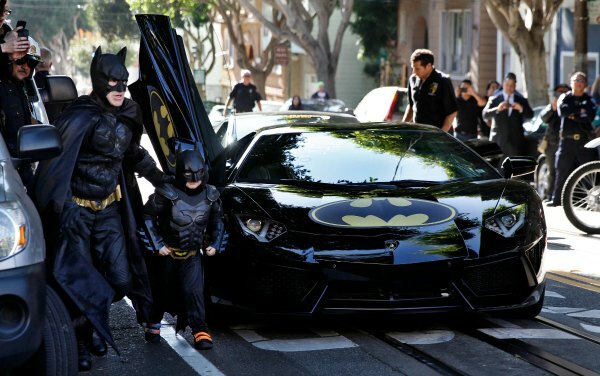 Streets were lined where Miles and his full-sized Batman partner, Eric Johnston, stylishly arrived in their black Lamborghini with Batman decals. Miles had a busy day, starting off by rescuing a damsel in distress. Later he liberated a bank vault the Riddler had burgled and then took time to recharge his Superpowers with a hamburger. Miles later had to take off to rescue the SF Giants mascot, Lou Seal, at AT&T Park. San Francisco’s chief federal prosecutor, Melinda Haag, and FBI agent, David Johnson, joined as well. They charged the Riddler and the Penguin with conspiracy to commit bank robbery, kidnapping and obstruction of justice in a faux indictment handed down today. Even the San Francisco Gate got involved by adding it to their crime blotter. 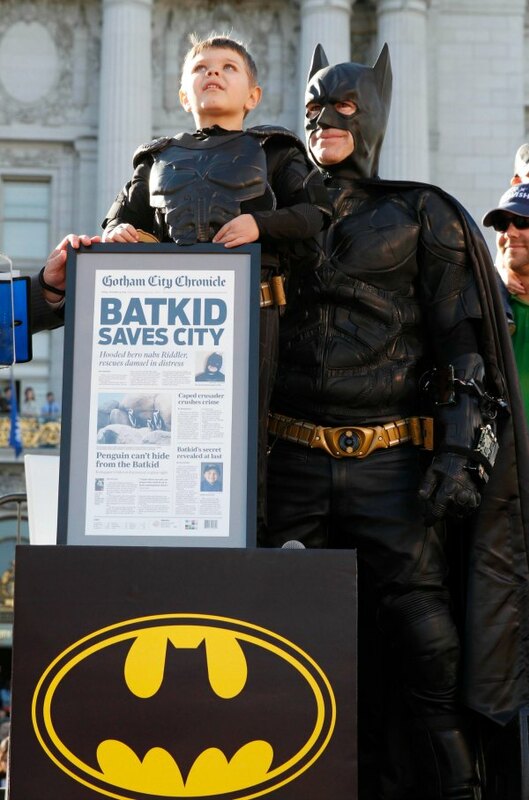 Finally, after a day fighting crime, Miles was given a key to the city of San Francisco by Mayor Lee, who declared November 15, 2013 as Batkid day forever. Miles was presented with a gift from the “Gotham City Chronicle” whose headline read “Batkid Saves City”. Thank you, Miles. You did more than save a city. Today you gave us hope. Unbeknownst to you, your crime fighting was a reminder that what we really want is a future where we all band together as every-day superheroes and make a difference. We are forever grateful, BatKid. Make-A-Wish® grants the wishes of children with life-threatening medical conditions to enrich the human experience with hope, strength and joy. According to a 2011 U.S. study of wish impact, most health professionals surveyed believe a wish-come-true can have positive impacts on the health of children. Kids say wishes give them renewed strength to fight their illnesses, and their parents say these experiences help strengthen the entire family. Based in Phoenix, Make-A-Wish is one of the world’s leading children’s charities, serving children in every community in the United States and its territories. With the help of generous donors and more than 25,000 volunteers, Make-A-Wish grants a wish somewhere in the country every 38 minutes. It has granted more than 240,000 wishes since its inception in 1980; nearly 14,000 in 2013 alone. Visit Make-A-Wish at wish.org to learn more. Images courtesy of Make-A-Wish/PaulSakuma.com. No compensation was received for this post although I used to work with Clever Girls Collective and couldn’t be more proud of their efforts today! Join Thompson Child and Family Focus for the public installation of a community-inspired, mixed-media mosaic mural that will grace the facade of its new Thompson Family Services building in Charlotte’s Grier Heights neighborhood November 15-17, 2013. This 170-square-foot mosaic, composed of more than 7,000 pieces of broken tile, mirror, and community-made ceramics, will represent the healing journey of children and families served by Thompson. People of all ages are invited to participate in the three-day assembly and installation process, which will be managed by mural designer and ceramic artist Leslie Scott of On-The-Wall. Scott designed the mural to create an opportunity for diverse groups of people throughout the community to collaborate in the making of textured ceramic pieces. Children and family clients, staff and donors of Thompson have been joined by individuals and groups from the Grier Heights community in the making of these ceramic pieces since early October, making this a true community work of art. Since 2004, Scott has been involved in the creation of large-scale, community-inspired works of arts for schools, nonprofits and community centers in California. As a recent Charlotte transplant, she has also designed mosaic murals for the Jewish Community Center in Charlotte, N.C. The Grier Heights Thompson Family Services Center will provide education, care and intensive support for some of the region’s most at-risk populations. Programs at this facility will include Foster Care, Outpatient Therapy, Intensive in-home services, School-based Intervention Therapy, Parent Education, Family Partners and Family Mentors. Thompson will serve more than 1,000 children and families from this new campus. There will be a public unveiling of the mural on Thursday, December 5 at 9 a.m. at the Thompson Family Services Center in Grier Heights. Sign up in advance at www.thompsoncff.org/mosaic.html. Children under the age of 12 should be accompanied by an adult. Location: Thompson Family Services Center, 769 N. Wendover Rd. Thompson Child & Family Focus is a Charlotte, N.C.-based nationally accredited nonprofit agency changing the lives of at-risk children and families through therapy, education and care. Last year, Thompson served more than 16,000 children and families across North and South Carolina from its four distinct campuses specializing in clinical and behavioral treatment, developmental education and proactive care. With almost 400 employees, and a 127-year-old mission of care, Thompson serves children and families through healing, teaching, worship and play. Recently, I’ve been reading a lot about The FEED Foundation and the work they’re doing. Created by Lauren Bush Lauren, FEED started when she designed a bag to benefit the United Nations World Food Programme (WFP) School Feeding program. As a WFP Honorary Spokesperson, she was inspired to help by the plight of the people she met traveling. The first FEED 1 bag created being used to help raise funds and awareness around the school feeding operations. The first bag was stamped FEED to signify it was used to feed one student for one year. To date, FEED has been able to raise enough money through the sale of products to provide over 60 million school meals to children around the world through WFP. FEED has also partnered with the US Fund for UNICEF, raising much-needed funds for their Vitamin A and micronutrient supplements program and providing over 46,000 children with essential nutrients. FEED Foundation is dedicated to supporting programs and organizations that are effectively working to fight hunger and eliminate malnutrition throughout the world. Last night, I ran across the FEED display in my local Target and bought coffee cups. My small, first, purchase from this organization. As a child, I remember my Grandmother having “adopted” a child in Africa and was sending money monthly to ensure they were fed and had access to medical care. I have friends who do the same thing through another organization. My husband and I have organizations we donate to as well. However, I’m also a firm believer in voting with my dollars. That’s what I did last night and I’m paying it forward again, by sharing here. But, it goes further than that. I live in America. Land of the Free. Home of the Brave. The largest superpower in the WORLD. Yet, 1 in 6 Americans are affected by hunger. While I’m certainly not an expert and can only research this topic to share accurate information, my friend Dresden from Creating Motherhood is someone I consider an expert. You see, she’s lived it. She and her mother were homeless. They lived in a car. And even on the food stamp program, they would skip breakfast to ensure her son had enough to eat to make their SNAP benefit stretch the entire month. Dresden and her Mother are two of the hardest working people you’ll ever meet, however they fell on hard times. It happens. And it makes me die a little inside to think about someone I love in this situation. With the changes to the Farm Bill and the SNAP Benifit (food stamps) she covers on her blog, I’m more than a little concerned the gap is going to close to a 1 in 5 or 1 in 4 number. Over 50 million Americans are struggling with hunger. What can we do? There is so much, I’m swimming over here just reading about all the ways to take action. We’ve got to be advocates. Because you never know when something could happen to someone you love and they could be in a food insecure situation, due to lack of money, loss of job, medical crisis… anything could happen. This map links to Feeding America. The numbers don’t lie and quite frankly, I don’t know where to start. Right now, I’m having a difficult time wrapping my head around the staggering statistics as I go from state to state. But, I know I have to start somewhere. Using my voice here is a good one.